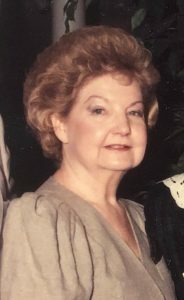 Mary Newman died peacefully in her sleep Monday December 3rd in Webster, Tx. Family graveside will be December 8th at 1 p.m., Anchorage Cemetary-Poteet,Texas. A Waco memorial will be held at a future date. Mary was born October 25, 1933 to John Isham and Betty Thomas in Shelby, Mississippi. Later the family moved to Columbus, MS where Mary attended school and graduated from Lee High School in 1950. Mary graduated from Mississippi State College for Women in 1954, receiving a Bachelors degree in English. Upon graduation Mary moved to Atlanta, Georgia and was employed by Delta Airlines as a flight attendant. She loved people and had many interesting stories about her trips and the people she met. Her favorite celebrity she met was Bing Crosby. Mary relocated to Dallas, Texas with Delta and was Delta’s 100th flight attendant and as such did many promotions for Delta. While in Dallas she met her soon to be husband Ivan Newman. They were married in in 1957 and to their union two daughters were born, Pamela Grace and Nancy Ann. The family briefly lived in Roswell, New Mexico while Ivan served in the United States Air Force. Her family re-located to Dallas, Texas while Ivan attended Baylor University School of Orthodontics. The family moved to Waco, TX. In 1965 and called Waco their home. Mary and Ivan were devoted Baylor fans and attended every game they could. Mary was a gracious person with a heart of gold. During her life in Waco she was active with the Waco Chapter of the Texas Dental Association which provided dental education and supplies to Waco school children. She was a member of the Waco Historic Foundation and was a past President of East Terrace. She volunteered for many local organizations but her favorite was the Brazos River Festival. Mary moved to Webster, Tx. in 2011 to be closer to Nancy and her two grandsons. Mary was preceded in death by her parents, in-laws Jasper and May Newman, Husband Dr. Wm. Ivan Newman, and brother John “Blue” Thomas. She is survived by her daughter Pam and son-in-law Paul of Waco. Paul’s children, Brandon and Adam Austin of Waco, daughter Erin Howell of Elizabethton, Tn., daughter Nancy Newman of Kemah,Tx. And grandson’s Austin Belknap of Jersey Village, Tx. And Michael Belknap of League City, Tx. Mary is also survived by her sister’s Opal Bell, Dolores Moore, and Polly Bennett. In lieu of flowers, memorials to charity of your choice.